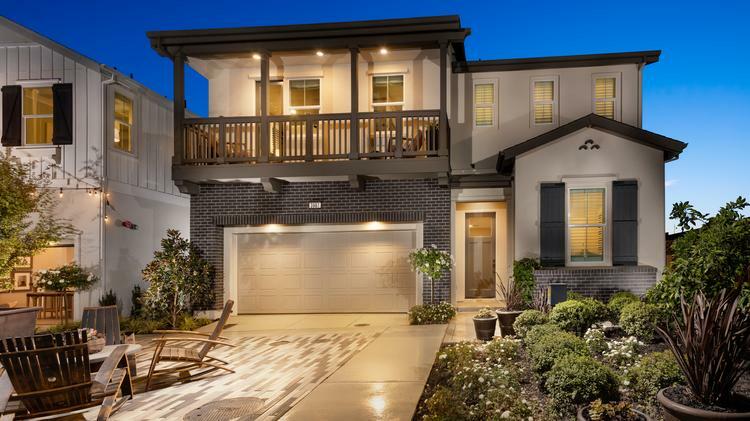 Trumark Communities’ Wallis Ranch development in Dublin has opened its first phase and expects its first sales to close this week, with total home sales projected to hit $1 billion. The 806-unit project transforms a 184-acre site with new infrastructure and a mix of townhomes and single-famly detached buildings, ranging from two to six bedrooms. One of the model homes in Trumark Communities’ Fielding project, which is one of the eight communities in Wallis Ranch development in Dublin. Homes range from 1,809 to 2,685 square feet, and three to five bedrooms. Trumark Communities, along with investment partners Isles Ranch Partners LLC and Castlelake LP, have divided the site into eight neighborhoods and sold seven of the sections to different homebuilders. Homes range from 1,900 square feet to 4,300 square feet, while prices range from the high $700,000s to $1.5 million, said Peter Kiesecker, chief operating officer of Trumark Communities. “We really like in our communities to provide diversity” of home type, he said. The project is another major source of new housing in Dublin, which has outpaced most of its neighbors with 2,644 units completed between 2007 and 2014, or 79 percent of its housing needs, according to the Association of Bay Area Governments. Separately, Brookfield Residential (NYSE: BAM), CalAtlantic Homes and the California State Teachers’ Retirement System is working on a 1,995-unit redevelopment of the former U.S. army facility at Camps Park. About 25 to 30 homes will open in the next two months, said Kiesecker. The rest will be built as they are sold, and he expects the entire project to be complete in three years. Trumark Communities is building one of the project’s eight neighborhoods. Other homebuilders include Warmington Residential, PulteGroup Inc. (NYSE: PHM), Taylor Morrison Home Corp. (NYSE: TMHC), KB Home (NYSE: KBH) and D.R. Horton, Inc. (NYSE: DHI), along with its Emerald Homes division. Trumark has also dedicated about 10 acres on the site to the city of Dublin to build a public park. The site includes over 3.5 miles of trails, said Kiesecker. The entrance of the property will have a bus stop that goes to the Dublin-Pleasanton BART station. Architects KTGY, Dahlin Group and Gates & Associates were the master plan architects. Teichert Construction was the general contractor focusing on infrastructure. Interior design firm CDC Designs designed the amenity center. During the project’s open house this weekend, about 70 percent of potential buyers were from Dublin and the surrounding area, while 30 percent were from the South Bay, said Kiesecker. Regardless of home size, all owners will pay monthly homeowner fees of $185 and will have access to the amenity space. “One thing I like about our community is all our homeowners pay the same,” said Kiesecker. The project doesn’t have any below-market-rate units and paid in lieu fees to the city of Dublin for affordable housing. Trumark Communities is also working on a 492-unit master plan in Manteca, California, where it plans to start construction this winter. Trumark’s multifamily development arm, Trumark Urban, is one of San Francisco’s most active condo developers, and is currently marketing the Pacific, one of the city’s priciest new developments.